In the historic centre of the city there is the palace of the Bessarabian nobles Riscanu-Derozhinski. The family Manor of Riscanu-Derozhinski was built in the 1870’s and designed by the renowned architect Bernardazzi. Many corners of Moldova, Chisinau in particular, are famous for its numerous monuments of architecture - historical buildings that once belonged to famous officials, religious leaders, artists, architects, writers or other members of the beau monde. All these houses, villas, town houses are the cultural heritage of the Moldovan state, and most of them are of national importance. 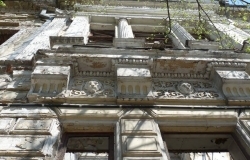 Bogdasarov Villa is a building with masonic symbols. Few people know that the building, which is No. 151 on the main Stefan cel Mare street, where today is the Chamber of..
Karl Schmidt proposed the idea of construction of a new building for City Office. For the City Council building was.. In 1844 the governor of Bessarabia the Earl Mikhail Vorontsov, proposed to Tsar Nicholas I a project of a horse.. Initially, this land spot was planned for rather different goals. The building, built on the block of the some cross –..
Monument of art, architecture and history of national significance. The construction of the building was initiated in.. In the historic centre of the city there is the palace of the Bessarabian nobles Riscanu-Derozhinski. The family Manor.. The Organ Hall building is a monument of architecture of the early 20th century and is located in the Moldova.. Architectural monument of national importance in the modern style with oriental motifs. Its author - architect Alexey.. Writer and filmmaker Alexander Konunov (Kunune) for the 1912-1992 years of his life, was born and lived in this house.. The house where lived an opera singer Lydia Lipkovski. Lydia Lipkovski (in Russia it is known as Lipkovskaya) - a..
House of Mihalaki Katzika. Masonic Lodge "Ovid 25"
It is one of the oldest buildings in Chisinau is situated on the street B.P.Hashdeu. 200 years ago on the river Bic could be found dams and watermills. Laterly there came into functioning the first.. The house on the 31 of August street, "Masonic House"
The building was built in 1892. There are "Masonic symbols" - a compass and a setsquare above the entrance. Monument to the Victims of the Transnistrian war of 1992.